It is up to you to decide whether to accept or deny our booking request. Opting out of the booking request will not affect you negatively in any way. Click Go To Booking. You will be directed to the Booking Request. Alternatively, head to inzpire.me and click on Dashboard in the menu on the left-hand side of the webpage. Under Bookings, there will be a pending booking request. Click on inzpire.me. You will be directed to the Booking Request. 2. On the booking request page, read the content of the booking request. 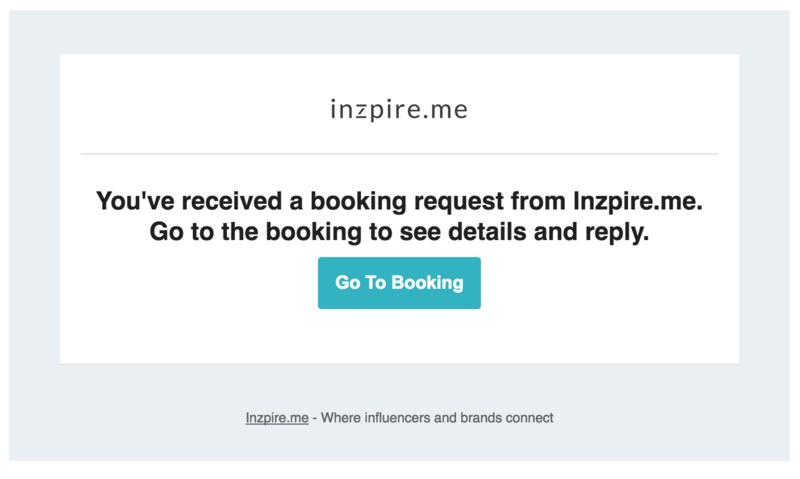 Our booking request will ask you to help us by inviting more influencers to join inzpire.me, because to make us truly awesome, we need as many influencers to join inzpire.me as possible. In short, the booking request will contain a unique referral link, and you will be asked to share this referral link on any of your social media channel(s) with your fellow influencers. In return, you will receive 10% of whatever your referrals make for the first 6 months. If you decide to accept our booking request, click on Accept Request. How should I share my referral link? You can be as creative as you'd like! There are countless ways of sharing the link. 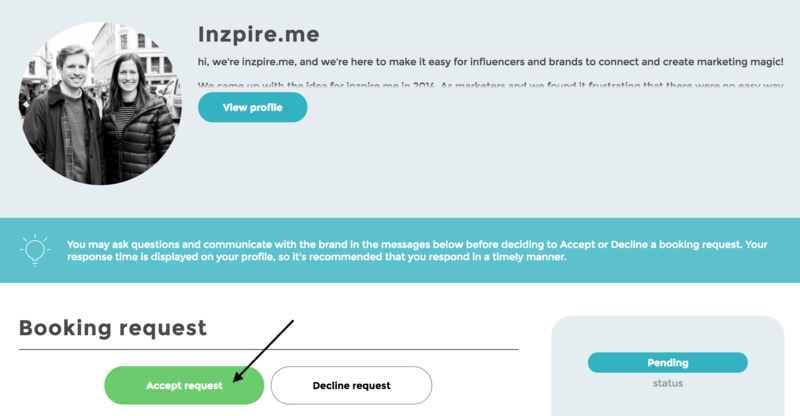 Some influencers choose to share a blog post about inzpire.me, while others choose to share their link as a Facebook post or Tweet. What social media channel(s) should I share it on? You can share your referral link on any social media channel and on as many social media channels as you'd like. We've had influencers add their referral link in the description of their Youtube videos and Instagram bios or as a post on Facebook. Others have chosen to share it on Twitter. Please note that Instagram does not allow links to be placed in a caption. If you'd like to share your referral link on Instagram, we recommend that you share it in your Instagram bio. 3. After you've shared your referral link, return to the booking request. Scroll towards the bottom of the webpage. In the Message box, send us the link to the post(s) where you shared your referral link. You can also send us any questions that you may have. 4. After you send us the link to your post(s), you can deliver the booking. Scroll towards the top of the webpage. On the right-hand side of the page, click Mark as Delivered. You will be asked to confirm the delivery of the booking. Click Mark as Delivered. We will be notified that the booking has been completed. After we Accept the Booking, the booking will be completed and we will write you your first review. 5. When we mark the booking as completed, you will receive an email notification. 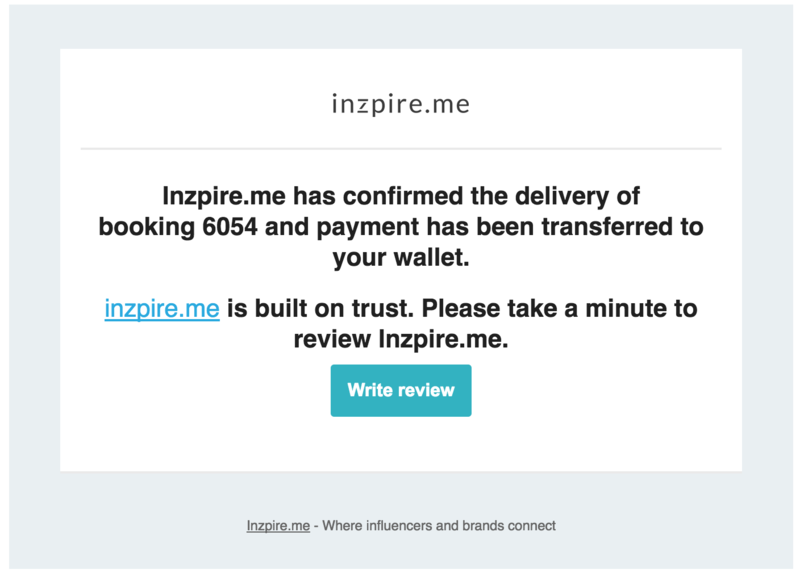 inzpire.me is built on trust, so you will also be asked to leave us a review. Alternatively, when we mark the booking as completed, you will also be notified on your Dashboard. You can click on the booking request under Previous and write us a review. 6. To access your referral link or to keep track of your referrals, click on Referrals on the left-hand side of the webpage. You will be able to quickly copy your referral link and view your referral earnings for the month.